Point Dume value! It is doubtful this large and expansive home could be duplicated under current code. Over ten thousand square feet expertly laid out with so much to offer. Step into a huge two-story entry and you are met with spectacular ocean, coastline and city light views. There are three levels - with the main level consisting of a guest suite complete with kitchen, living room, dining, family/theator room and expansive kitchen and breakfast room. 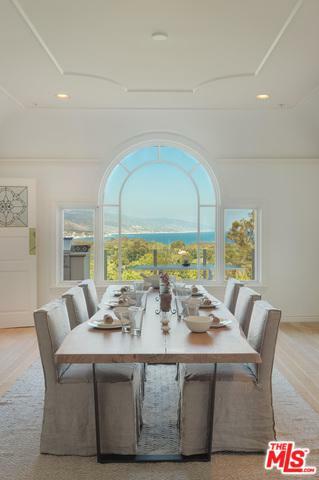 The upstairs has a huge secondary ocean view family room, five bedrooms (including master), office, den and balconies overlooking the european pool or ocean views. The lower level consists of a trophy/card room, gym and dance room. There are two garages - one also serves as a shop complete with grease trap, workshop and bathroom. Gated access and seclusion - perfect for entertaining. This offering is one-of-a-kind. Listing provided courtesy of Madison Hildebrand of Compass.